When I first read that Donald Trump called for lowering U.S. wages, I thought this was a crazy thing for him to do if he really intended to get himself elected president. But then I realized that it actually made perfect sense. Here's why. Of the 92 million people who voted, 27 million had no education beyond high school graduation. In contrast, 65 million had an education level beyond high school graduation. Because most people with only a high school education or less work for an hourly wage, and most people with at least some college education (including the 15 million voters who had an advanced degree) do not work for an hourly wage (but rather for a salary or are self-employed), it seems reasonable to use these education level figues as a rough indication of the relative numbers of wage earners versus non-wage earners who actually vote. It thus seems that wage earners make up only about 29% of those who actually vote. Of this relatively small number of wage earners who actually vote, some are going to vote for the Democratic Party whether the Republican Party candidate calls for lowering wages or not. And the ones who will vote for the Republican Party candidate are most likely thinking about non-wage issues such as immigration or foreign policy or abortion, etc., and hence their main concern won't be whether or not the GOP candidate says wages are too high. Of the non-wage earners who actually vote, it is a fair guess that wages are not their main concern, and Trump's claim that wages need to be lowered to "make the U.S. competitive" will even resonate with some, especially those in the Republican party whose votes Trump is seeking in the primary elections. HOW THE ELECTIONS WORK IN THE U.S.
Only about 43% of the people of voting age in the United States actually vote in presidential elections, as shown here. The ones who do vote are only allowed to vote either for a) politicians (such as everybody from Trump to Bernie Sanders) who accept class inequality as an unquestioned and permanent reality and who therefore are portrayed as "respectable" and "serious" candidates in the plutocracy-controlled mass (and alternative) media and who, thus, have a serious chance of winning, OR b) politicians (none of whom are running for national office today that I am aware of) who call for abolishing class inequality and who therefore are either totally ignored by the mass media or who are portrayed in the mass media as so marginal and bizarre that they have no serious chance of winning and therefore anybody who votes for them is just "throwing away their vote" OR c) politicians such as Jill Stein of the Green Party who, while not challenging the idea of class inequality, are still treated as marginal and not serious by the mass media. The "respectable" and "serious" candidates play a divide-and-rule game with ordinary people that works like this. One will make a promise to a particular section of the general public, but always in a manner that does not challenge class inequality. Then the candidate from the other party will, on the basis of the logic of how things work in a society based on class inequality, either argue that the first candidate's promise will actually just make things worse for its supposed beneficiaries, or that it will make things worse for a different section of the public. For example, one candidate will call for raising the minimum wage, and the other candidate will argue that this will only result in businesses reducing the number of people they will hire and therefore throw minimum wage workers out of work. Or one candidate will call for making it easier for undocumented ("illegal") immigrants to remain in the country and the other will say that unless they are deported these immigrants will take away American jobs and force taxes up to pay for their welfare. Or one candidate will say we need some new multi-national trade agreement to open up more markets for U.S. products and thereby help small businesses and increase employment, and then the other candidate will say "no," it will mean terrible new treaty laws that will make working conditions for American workers worse and make it easier for U.S. businesses to move off-shore and lay off American workers who don't agree to wage and benefit cuts. Result? Some people decide their only choice is to vote for the "lesser evil." Others don't vote at all because they don't think it could make a real difference no matter how they vote (which is true, as discussed here). 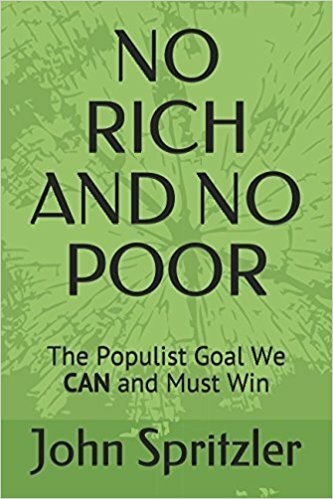 After the election, the plutocracy's mass media will claim that whatever the winning politician does (and it will always be to maintain class inequality one way or another) it is the "will of the people" because, after all, he or she was elected, fair and square. This is fake democracy. In such a fake democracy, a Donald Trump can call for lowering American wages and still expect to win the election. It's time to aim for a genuine democracy, in which the vast majority of people are able to make society be the way the vast majority want it to be--without class inequality. This is discussed at www.PDRBoston.org .